“Not without Mittens.” Chel mustered up the last of her courage, beginning to feel afraid now. Lexx let go with his left hand, lifting it as though he was about to slap Chel. “Look Human! You …” He hesitated, realizing what he was about to do and wondering if he should. He had never struck anyone out of anger,… but he’d also never struck his dice before when they failed. The hesitation cost him. The deciding thought followed the sudden flash of pain from his right leg. Lexx grimaced and loosened his grip on Chel, but didn’t let her go. That had really hurt. Zeta was clinging to his leg, jaws clenched tightly. The black fabric was already taking on a dark and wet appearance around Zeta’s mouth where blood was soaking. 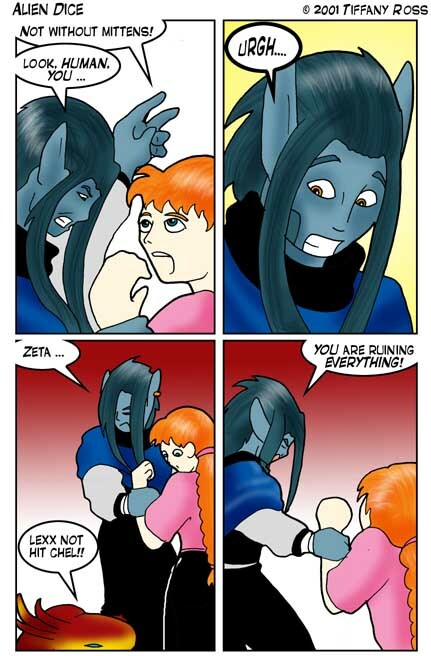 “Zeta?” Lexx inhaled sharply, surprise taking over his anger that his own dice had just bit him and it really hurt. “No hit Chel!” Zeta snarled in a muffled tone, loosening his hold, but only so he could talk. “You are ruining EVERYTHING!” Lexx turned and pulled Chel with him, pain shooting up his leg as Zeta tried to stop him. Zeta’s added weight pulled at the fresh wound and Lexx decided to give in and let Chel go. Zeta let go immediately, hissing in defiance.